Little Hiccups: Two Sparkly Ears... Finally! Yesterday Ava finally got the courage to do something she has been wanting to do for almost two years - she got her other ear pierced! That's right, her other ear. 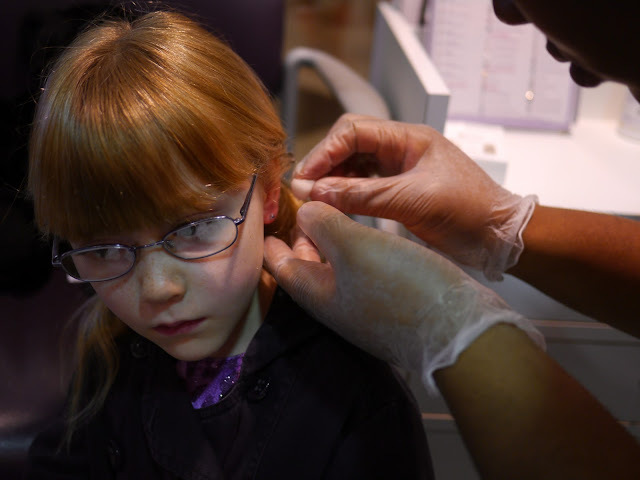 For almost two years Ava has been sporting just one sparkly little earring in her right ear. 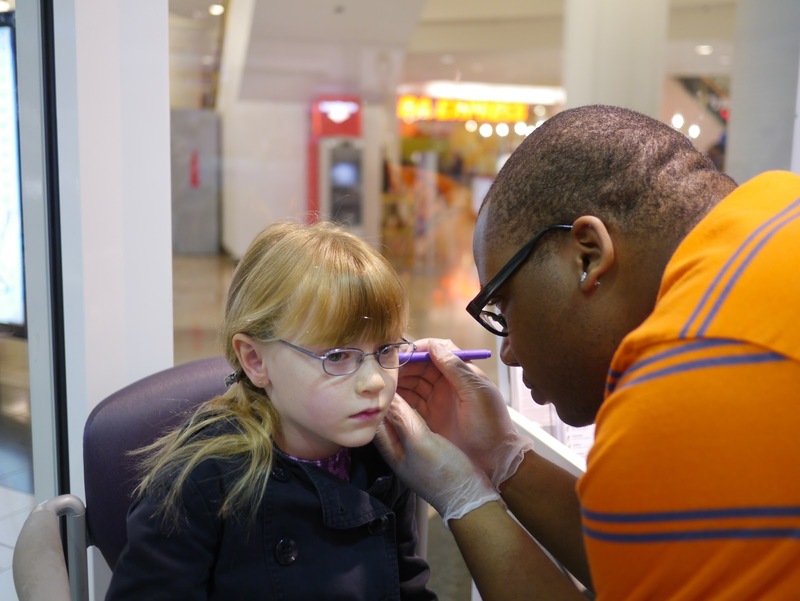 We had attempted to get both ears pierced just after Ava's 4th birthday however after the first ear was done she was so upset that we had to put off doing the second one. We've had a few attempts through the years to get the second ear done but it has always ended with Ava in hysterics in anticipation of the pain. I had resigned myself to the idea of Ava having just one pierced ear for the next however many years but then something happened that made Ava decide that it was time. Her best friend Milla got her ears pierced! 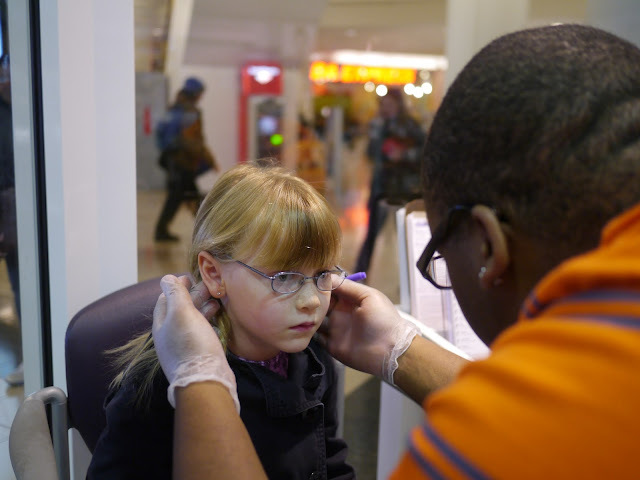 So yesterday after Ava's ice skating lesson we headed to Claire's on Market Street to rectify those unbalanced ear lobes! 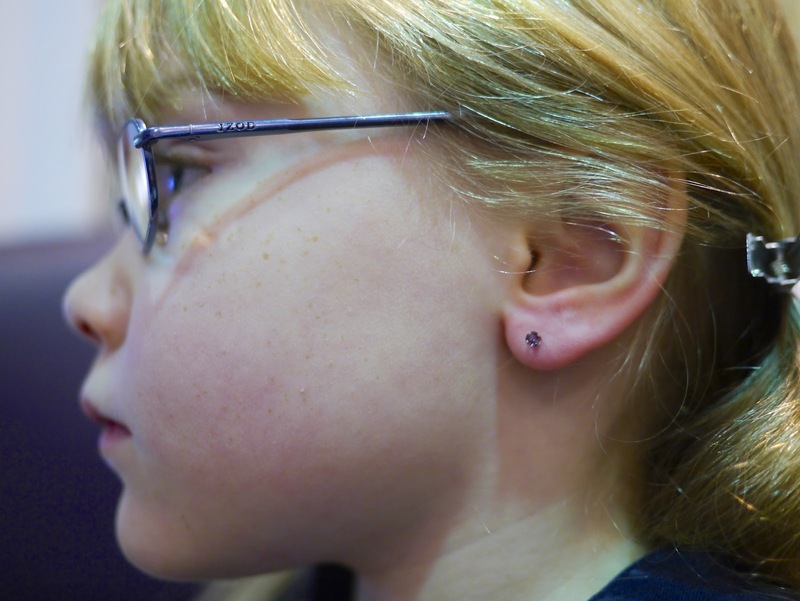 Ava chose a nice pair of amethyst studs as her new earrings. Amethyst is her birth stone (February) and it's also a pretty colour. Check and check. It also happened to be a perfect match with Ava's ice skating leotard that she was wearing at the time! I had half expected Ava to change her mind when we got there but she was very brave. 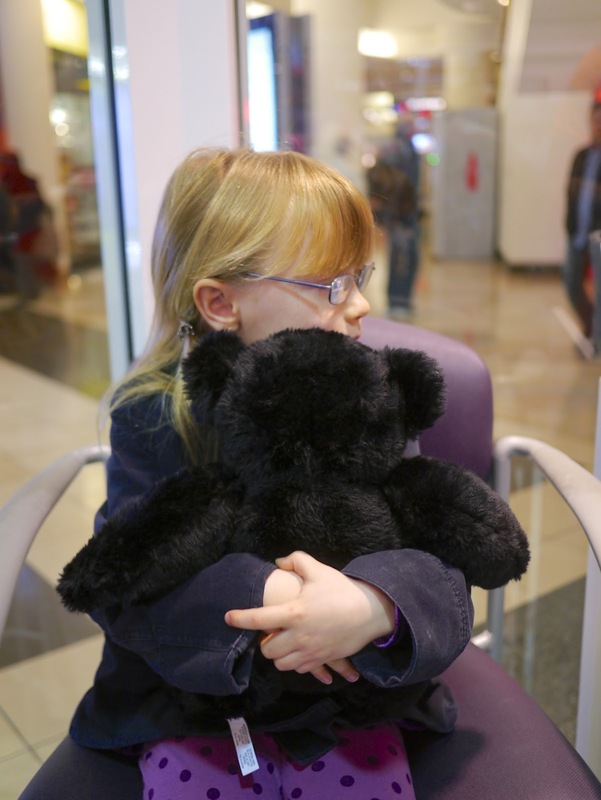 She was given a teddy bear to hug and sat very still while the whole thing was done. 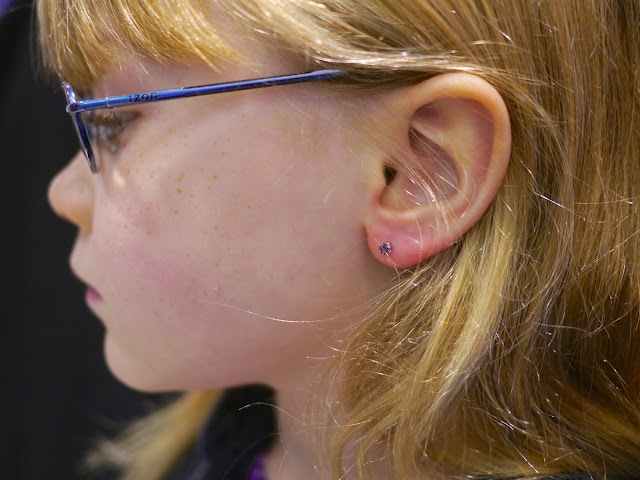 She did look a little worried the whole time but there were no tears at all - a stark contrast to her first piercing experience! A bit of a clean and we're all done! As a reward for being such a good girl Ava was treated to a cupcake. Lola got one too, although as Ava pointed out, she didn't even have to get her ear pierced for it! 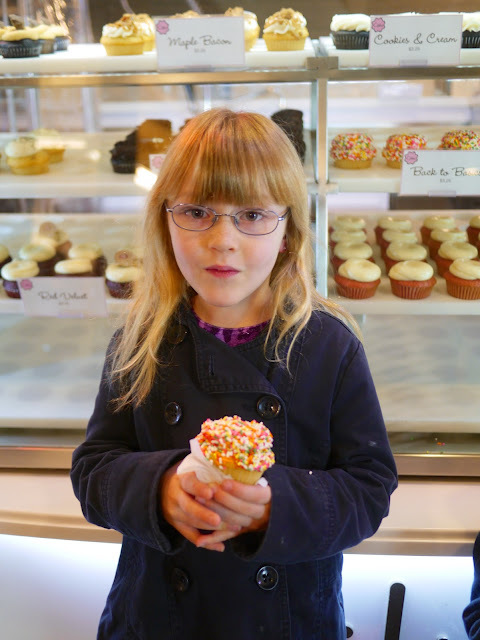 You read correctly - those are Maple Bacon cupcakes behind Ava! 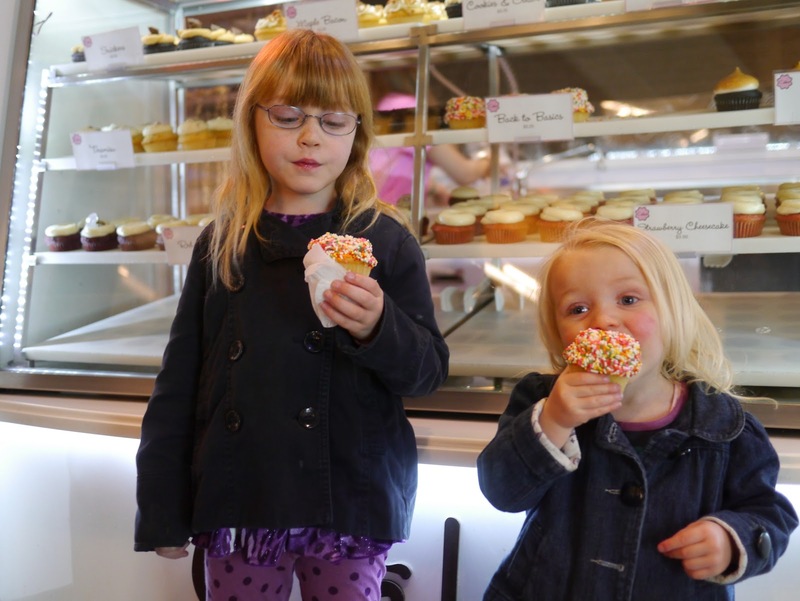 Lola got a cupcake too - and she didn't even have to get her ears pierced for it! Aaaawwww! She is so cute! And so brave! Finally two earrings :-) Is that freckles I see on Ava's nose? She never used to have that many freckles (or sun kisses, as Milla calls them), did she? Very cute. 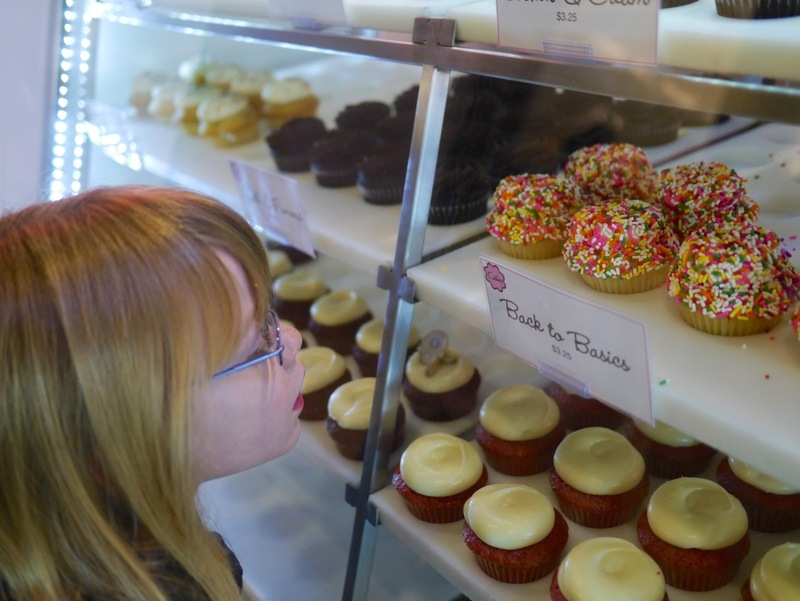 And those cupcakes do look delicious! I reckon bacon and maple would be great. When we have pancakes for dinner back home (real big, flat ones, not as big 'pikelets'), we put it on the plate, sprinkle sugar and bacon bits inside, roll it up, and eat it with a bowl of green pea soup. It's so good. Take us to that cupcake place in the summer, ok?! 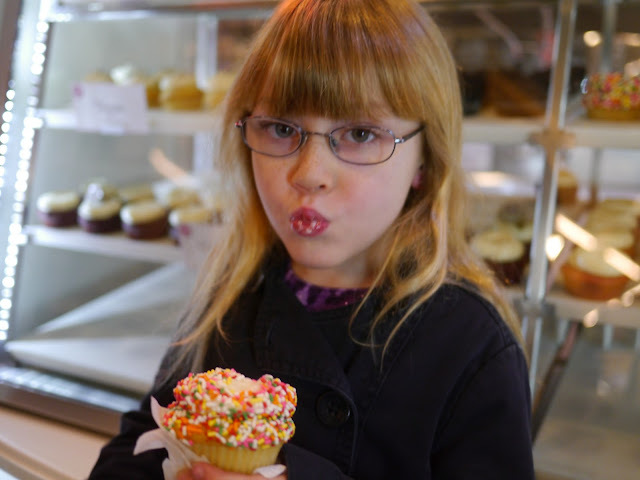 The cupcakes are at a local chain called Cako. I'll add it to the list of places to take you. It's going to be a long list!